With 32 confirmed planes shot down, George Beurling was one of the top Allied aces of WWII. He was not a conventional kind of guy, some could say paradoxical. He flew with a bible his mother had given him, yet he had an un-Christian attitude in killing opponents. He craved attention and fame, caring only for his standing as an ace, not for promotions or leadership. His love for attention was shallow, he couldn't form stable relationships with men or women. Many opposing words can be used to describe him. Rebel, irresponsible, ace, blood-thirsty, lone wolf, unfriendly, opinionated, rude. But he gave his all to a war that did not really concern him. He excelled at flying a heavily armed warplane at great speeds with precision and great effect. Despite his many shortcomings, the Allies got a bargain when they hired George Beurling. 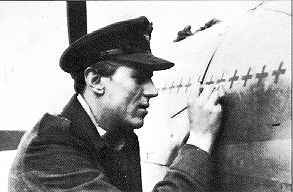 Beurling died in a non-military plane crash in 1948.